Autumn gives way to cold days and nights. Just about all colors in nature have faded and plant life has gone dormant. 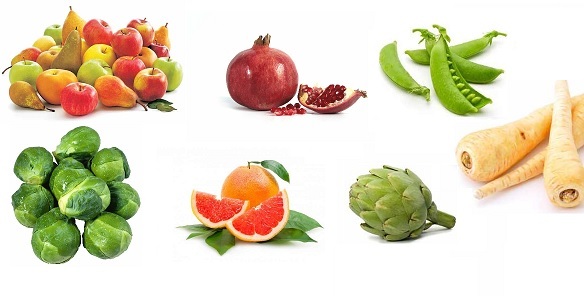 But colors of nature are always at work, and they can be found in the foods we consume through the winter months. Like Belgian endive, which peaks in late November and is generally available through early spring. Also available year round, are Brussels sprouts, which normally peak in the fall to early winter. Through the winter we can obtain artichoke, bok choy, snow peas, and water cress. Of course most of that produce is green in color. If you want to see color then feast your eyes on the red beets as well as green and red apples, including green and red pears. There is also oranges, blood oranges with its sweet red colored flesh, red pomegranates, and yellowish parsnips. 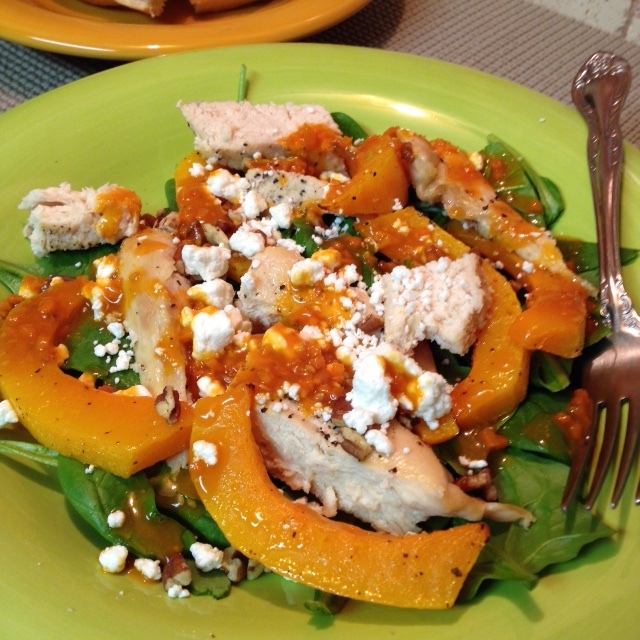 Not to forget cream skinned butternut squash with a deep orange hue colored flesh, and that brings us to our feature recipe: Roasted Chicken and Butternut Squash with Spinach and Goat Cheese Salad. Here at Splendid recipes and More we keep the health conscience in mind who not only wish to eat healthy, but also wish to know the nutrient value of the food they consume. Butternut squash has folate which helps to build a strong heart and prevent a heart attack. The function of folate is to work against compounds that compromise the structure of the blood vessels. A correlation between consuming foods that contain folate and reduced incidences of colon cancer. Researchers have found that a vitamin A deficiency, caused by A carcinogen in cigarette smoke, contributes to a vitamin-A deficiency, which leads to the debilitating disease of emphysema. Any winter squash including butternut squash, are rich in vitamin-A, which research suggests could protect against emphysema. It would be ideal to stop smoking, a diet rich in vitamin A and beta-cryptoxanthin may protect lung health if a person choose not to quit or is daily exposed to cigarette smoke. Now for the recipe, and here is what you will need. 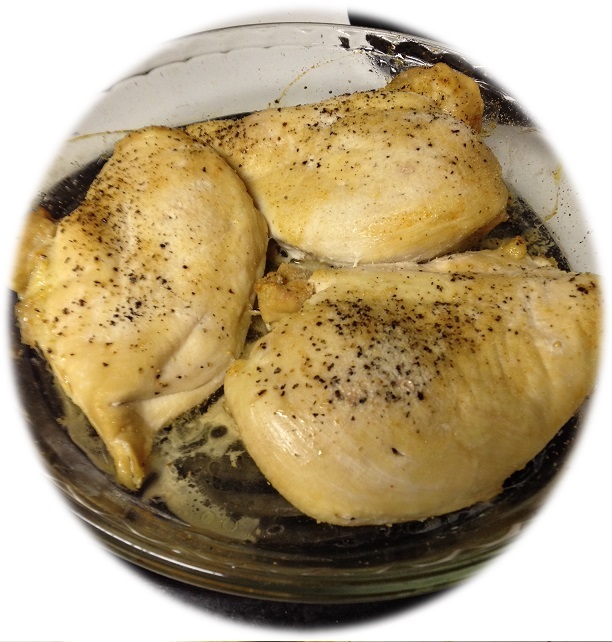 Arrange chicken breasts onto a glass baking dish, and sprinkle salt, pepper, and garlic powder according to taste. Place into a 350 degree oven and roast 10 minutes. Turn breast over and reapply salt, pepper, and garlic powder, and roast another 10 minutes. Check internal temperature of meat, if it is at least 160 degrees remove meat and set aside. Prepare butternut squash and place into a large bowl, but only after spooning in 2 tablespoons of olive oil, salt and pepper to taste. 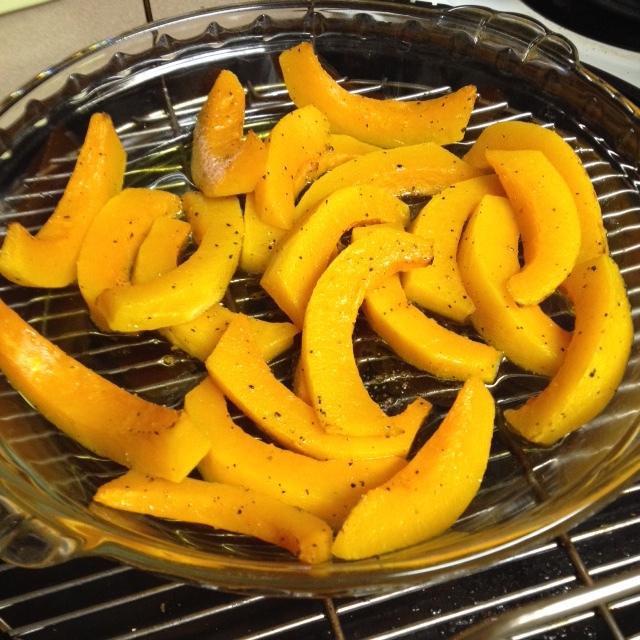 Roast in oven on 350 degrees for about 10 to 15 minutes or just until squash is baked but not soft. Remove from oven and set aside. Using four dinner plates, plate each with 2 cups of spinach. 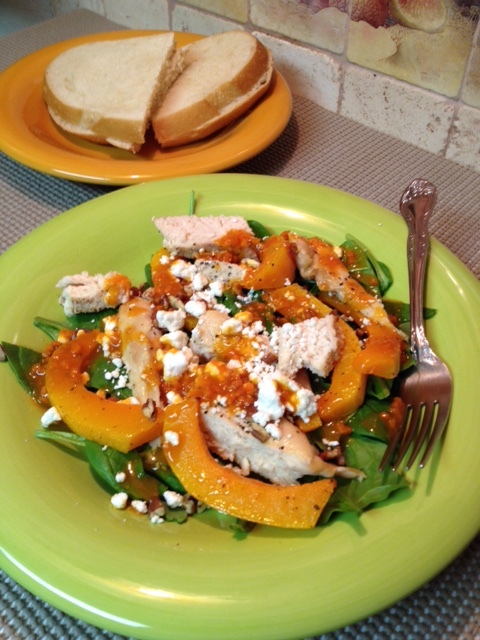 Top with sliced chicken breast (about 4 to 5 slices) and 5 to 6 slices of roasted squash. Top with pecans, and cheese, then pour on the Carrot and Ginger dressing (purchased at Whole foods Market). Serve and enjoy! Salad can be eaten warm or cold, and served with fresh sourdough bread and real butter. This entry was posted in Chicken, Salads as a Main Course and tagged Brisket, butternut sqaush, Butternut squash, carrot and ginger dressing, cigarette smoke, colon cancer, Cookware and bakeware, Cumin, emphysema, Fennel, Goat cheese, Kielbasa, lung cancer, roasted vegetables, Roasting, smoking, Vegetable, Whole Foods Market, winter vegetables. Bookmark the permalink. I hope you and your family had fun bringing in the New Year. Your friendship has meant a lot to me. Thank you so much for your advice and expertise on nutrition on my serious digestion health crisis. I am on the way to recovery now. I have so enjoyed your recipes as well. It gives me inspiration to find apetizing and nutritious meals. Best to you in 2015 Roger and Aaron as well. I hope you enjoy your meal tonight. Hi Honey, our New Year started off go. Thanks for your friendship and cofidence in my nutritional abilities. I am very excited your dugestive problems are improving. With all that food you grew over the summer and canned, I am glad some of my recipes can inspire you! Please let others know about Splendid Recipes and More as well as the Health News Library ( http://www.healthnewslibrary.com ). This looks gorgeous, including both a green and orange vegetable (good for nutrition, too)! I will try it, but without the chicken. With some extra pecans added, it’ll make a high-protein vegetarian dish. Hey thanks JoAnn. Most of the maun salads i make are versitile. Make with or without chicken. Thanks for re-blogging this recipe as well. Oh my! This looks & sounds delish!